In a May 1991 referendum, following the collapse of Communism in Europe, over 93% of Croatian citizens voted for a ‘sovereign and independent Croatian state’ free from the Serb-dominated Socialist Federal Republic of Yugoslavia. The government of Serbia, under Slobodan Milošević, initiated a propaganda campaign, stirring ethnic-Serbs, who totalled 11-12% of the Croatian population. It called for an ethnically pure ‘Greater Serbia’, to stretch through Bosnia Hercegovina and encompass approximately one third of Croatian territory. Anti-Croatian sentiment was encouraged and Serbian fears incited as the propaganda set in motion. The Yugoslav National Army (JNA), transformed into Milošević's Greater Serbian Army. Having simultaneously disarmed the Republican Territorial Defence Forces whilst arming Serbian insurrectionists the previous year, a campaign of terror ensued as JNA-supported Serb-rebels and paramilitaries commenced large-scale intensified ethnic cleansing and murder of Croatia's non-Serb population. With cities, towns and villages relentlessly bombed from air land and sea and Croatia's religious and cultural symbols detonated the International Community looked on. Many justified this crime against humanity based on economics or traditional ties; supposed political or ideological grounds - others simply didn’t care. 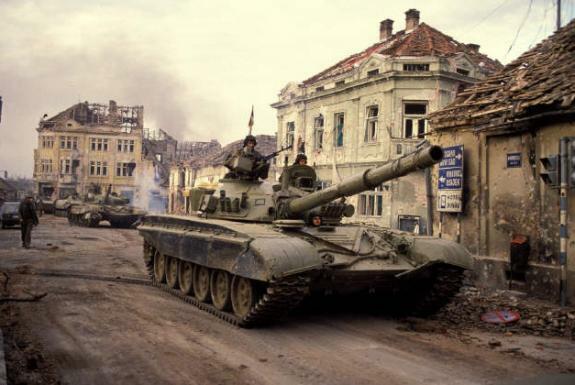 With the gross military imbalance, blatant aggression and thousands of Serb regulars, reservists and paramilitaries advancing with their inexhaustable weaponry, international outrage finally compelled the UN to act. Its solution was merely to appease Milošević and endorse arms Embargo 713 - denying the lightly armed Croats weapons vital to their defence. The Greater-Serbian forces then set about the annilhilation of the nascent Croatian army. This web site is dedicated to the memory of Croatia's Defenders.